Boy, don’t I look smug. What can I say. I had just set in the sleeves and was feeling happy! Thanks very much to everyone who gave their opinion! I just loved reading your comments; and thank you for being so many to vote! I guess this one was meant to have sleeves. 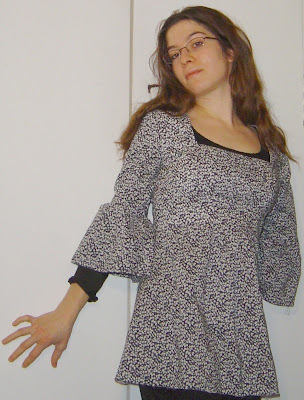 But, as several of you suggested, I might totally make another one sans sleeves, for summer. Great idea! Top on its own (unlayered). Sorry I look tousled and wan and all – I was (am!) on my way to bed. I’ll hem the top and snip the dangling threads ASAP (I do want to wear it soon! ), and then post better pictures and a review for you. Sorry for making this quick and dirty, but it is late and I need to get up real early tomorrow. Good night, everyone! Thanks again. I love the sleeves, very cute. I missed the voting, but I think it looks great with the sleeves. I *love* cotton lawn, you can’t go wrong with such a wonderful fabric. Love it! I had voted for no sleeves, but now I’ve changed my mind! LOL! Lovely, lovely sleeves. You will enjoy wearing this top very much. C’est vraiment très joli et cela te va si bien. Et puis quelle excellente idée de la refaire sans les manches une prochaine fois.Par contre, je te trouve toute tristoune et fatiguée sur les photos…Je te fais de gros gros bisous ! You look so diva-ish in the photos! They are fabulous…oh and the top is great too!! Looks lovely on you. Very airy and perfect for spring. J’ai loupé le vote mais… superbe !!!! J’aime bien la pose aussi! Lovely top! I just picked up the pattern last week. I am excited to sew it up now. You did a wonderful job. Cute! Of course, keep these sleeves and make another sleeveless top for summer. Like I said yes it looks wonderful on you. You are such a clever seamstress. Hello my dear Isabelle !Your top is very pretty as it is. And as you said, you can do another one without sleeve for summer, if you want to.Have a good evening ! Looks fabulous with the sleeves Isabelle! It’s adorable and the sleeves really make it so. Kudos! I was gonna say ‘do the sleeve’! Very cute! You look absolutely darling! You have done a beautiful job fitting the bodice–and have skillfully avoided your dreaded pregnancy shirt syndrome! Très chic! I think sleeves were the right choice. This is beautiful. But definitely make a sleeveless one for summer, too – it looked good that way, but better with the sleeves. I love this top. It’s in my UFO pile, yet to be even cut out. It looks good both ways, but Iike it with the sleeves. Lovely! Looks great, Isabelle. HOpe you’re well. HOw’s the ankle these days? Adorable on you with the sleeves. I also liked it sleeveless so do make another one for summer wear.Happy Stitching! I like it without the sleeves, but I like it with the sleeves just a little bit better. I’m glad that you put the sleeves in too! I really like the finished look on you. And like you said, you can make a sleeveless version for spring/summer and you will then have gotten so much use out of the pattern! It’s lovely! It’s gorgeous dear one! That blouse suits your little waist and slim shoulders so perfectly! Oh, I really like the sleeve! Such a cute top! The top is adorable! I love it layered and alone. I also think if you decide to make a sleeveless version later that will look great as well. You can’t lose with this top no matter what you do with it. It’s a great style on you. Well done! It’s so nice to have you back. Ma chère Isabelle !J’espère que ce week-end t’a permis de te reposer un peu et de faire le plein d’énergie pour cette nouvelle semaine qui commence.Je t’embrasse bien fort. Gorgeous Isabelle! Hope you had a great night sleep. Ann. A very pretty top Isabelle. I’m sure you will be making it sleevless as well as that is also adorable. I like the top. It’s great fit! Great looking top! You can wear this style so well!